Click now and register for your chance to win! 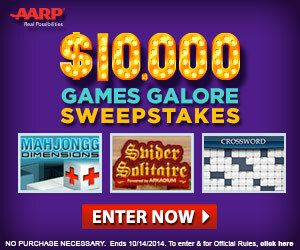 Earn additional entries towards the $10,000 grand prize by playing the most popular games on AARP.org. Make sure you return each day to earn additional entries. Good luck! Sweepstakes is open to ages 45 and up. Ends 10/14/14 at 11:59 P.M. ET. No purchase necessary. A purchase of any kind will not increase your chances of winning. To play and for Official Rules, including odds, and prize descriptions, click here. Void where prohibited.